The people of Israel act as a central junction in the human network. If we try to connect positively above our differences, we let nature’s positive connective force flow through us into the entire human network. As a result, people start changing, albeit unconsciously. Connection would become more valued, and as a byproduct, the attitude toward the people of Israel would become more positive. On the other hand, failure to invest in enhancing human connection invites the negative force to further fuel humanity’s subconscious, enabling the flames of hatred to rise higher and higher in our direction. 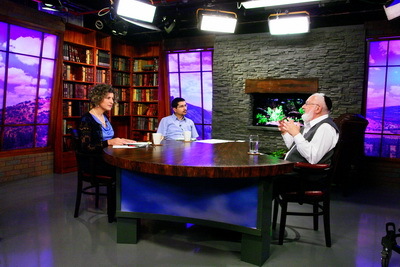 Question: How do Kabbalists feel about science and technology? Answer: Kabbalists view science and technology, and anything that progresses the world, favorably, so that people see as quickly as possible that it all gives us nothing. Question: In other words, are you in support of robots and artificial intelligence? Answer: Yes, let everything around us be artificial: doctors, lawyers, etc. This is exactly what will help people understand where their true purpose lies, what they must actually be doing in this world. Question: It is written: “His wisdom is greater than his strength.” What does it mean? Answer: According to Kabbalah, it is very bad when intelligence, wisdom, surpasses action. Because first of all, I need to lower my head and receive higher knowledge. And when I adapt this knowledge to myself, I must then work with it within the group. During the process of working with it, it becomes clear to me what all these actions are for, and only then do I begin to use them as my own thoughts, my own methods. Question: “We shall do and we shall hear” also applies here? Answer: Yes. First the action must be carried out because only this attracts the upper Light, and within this Light, we will begin to understand everything. What Determines The Level Of A Soul? Question: Regarding the development of a soul, is it a development of the desire to receive the Light of the Creator? Question: What determines the level of the soul? Answer: There are five spiritual worlds—Assiya, Yetzira, Beria, Atzilut, and Adam Kadmon—after which comes a world of Infinity. Each one has 25 levels of attainment in it, so there are 125 levels in total. They come from the integration of Light and desire; therefore, we simply state this fact. 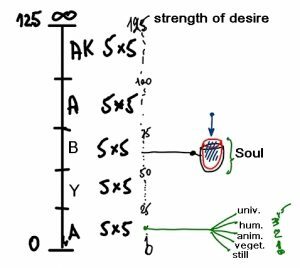 The level of the soul is determined by the number, that is, the strength of my desire from 0 to 125. Question: What kinds of souls are there, for it says that there are still, vegetative, and animate levels? Answer: They are simply gradations that have no relevance for us. You should not think that there is an animal soul in an animal, a human soul in a person, and an inanimate soul in a rock. It means that each desire contains five components: still, vegetative, animate, speaking, and universal. Based on that, we say, “His soul has settled into an animal or a plant.” They are nothing other than levels of desire. Just as I have a desire to consume, let’s say, 100 grams of one thing and a kilogram of another, such is the difference between the animate desire and the speaking one. These are simply token names having no connection with our world. Indeed, everything is accurately regulated, spelled out, and quantitatively divided according to levels of energies, strengths. True giving and receiving is based on the intention to benefit others. The giver should make sure that the recipient will enjoy without any negative feelings like shame, and the recipient should have the attitude of doing a favor to the giver by receiving from him. This can only happen when we rise above all self-concern and connect to a higher force.